Here’s an exciting development for those who enjoy debating whether we’re headed for another Cold War: The New York Times reports that several Obama administration officials are leaning toward sending defensive weapons and equipment to Ukraine, to aid in their fight against Russian-backed separatists. NATO and Ukraine allege that despite being hit with economic sanctions, Russia has been providing the rebels with heavy weapons and tanks. 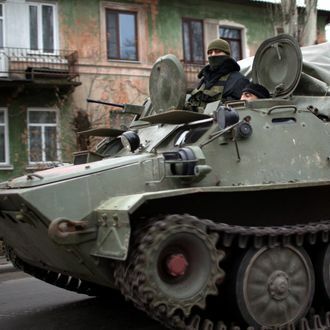 So far the U.S. has only sent Ukraine “non-lethal” items, such as body armor, night-vision goggles, and medical supplies, but now the U.S. is reconsidering that restriction, since it doesn’t seem to be discouraging Russia from escalating the conflict. President Obama has yet to make a decision, but NATO military commander General Philip M. Breedlove, Secretary of State John Kerry, Chairman of the Joint Chiefs of Staff Martin Dempsey, Defense Secretary Chuck Hagel, and National Security Adviser Susan Rice are said to support the idea, or at least be open to it.